You (two dear, faithful readers, Google-bots and random passers-by) must have wondered when Dickens was going to show up here. He is, after all, pretty much the man who gave Christmas back to England, not to mention the author of one of the most Christmasy of Christmas stories. I'm sorry, did I say "one"? As if Dickens would limit himself so: He published no less than five Christmas books over a six year period (The Chimes, The Cricket on the Hearth, The Battle of Life and The Haunted Man and the Ghost's Bargain, in addition to the one you have heard about), and not content to stop there, he edited Christmas numbers of his journals to be read at Christmas, like Dr. Marigold's Prescriptions or Somebody's Luggage, Mugby Junction, The Haunted House etc, etc; Dickens was Mr. Christmas. Even his final, unfinished novel, The Mystery of Edwin Drood (the murder mystery without an ending) has the crucial event centre on Christmas. But while most of these stories or collections have been largely forgotten, there is one that remains. First published 171 years ago today. A Christmas Carol is the ultimate Christmas story: A frozen soul turned to life and warmth (I am not joking about that theme running though these Christmas stories). And quite apart from the introduction of Tiny Tim, Bob Cratchit, and Scrooge (which, like Grinch, remains a term for the non-Christmas-compatible -- presumably with a hope that they may be redeemed), it is credited with introducing the faux-authentic Christmas traditions that the Victorians embraced with such enthusiasm -- in fact, Thomas Carlyle (who at the time was not really a Dickens fan) read the story and promptly sent out for a turkey; before "A Christmas Carol" the most common Christmas bird in Britain was the goose. 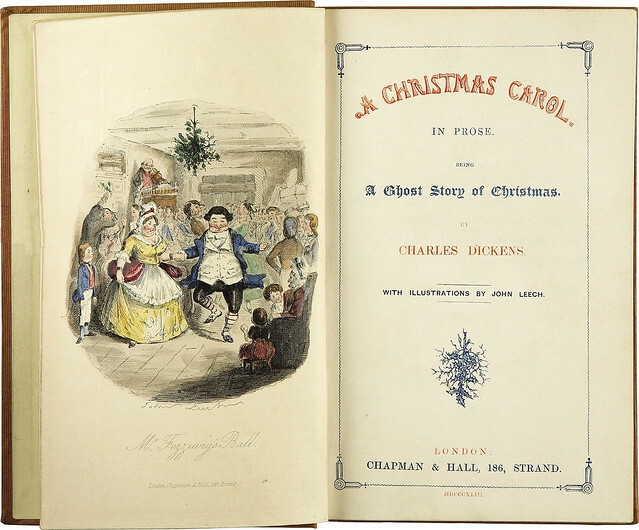 The book was first published on December 19, 1843; and by Christmas Eve it had sold out. Not that Dickens made much from the success -- as people are fond of pointing out, he only made £175 on the first printing because he had insisted on such a low sales price for a very beautifully bound book. I have written about A Christmas Carol before, however, and I won't repeat now what I said then -- (so you should go read it there, as what I said is still valid); today's Christmas story entry has therefore been around for a while. Before you start grumbling about the easy way out (and the horror of having to click on links), however, I thought I'd add to the fun by pointing you in the direction of some additional resources. I would also like to note how the Christmas Dickens creates with this story is primarily a secular Christmas. Jesus is not mentioned once, God and the Lord only show up in exclamations and dialogue wishes of a happy holiday, and no birth is mentioned. The focus is entirely on the importance of human solidarity in a cold world, and on the need for cheerful company during the Christmas holiday. Here, as usual, the evil is that which is frozen, and hope lies in warmth and renewal. Denne har jeg lest. I 2007, tror jeg, på en flytur til Amsterdam som startet med at vi måtte vente i flyet i et par timer mens de brøytet rullebanen. Han jeg satt ved siden av spurte hva jeg leste, jeg sa A Christmas Carol, og han sa han ikke hadde hørt om den, for han var ikke kristen. Den var ganske lettlest, mener jeg å huske, så det er kanskje på tide å lese den på nytt og tenke litt over tingene du nevner? Det er mange rare folk i fly. Altså, når jeg blir skitrik så skal jeg kjøpe meg en førsteutgave av denne. Ingen tvil. Den skal stå sammen med magna carta og code civil i en blytung bokhylle.